Remodeling projects can be stressful undertakings for homeowners. 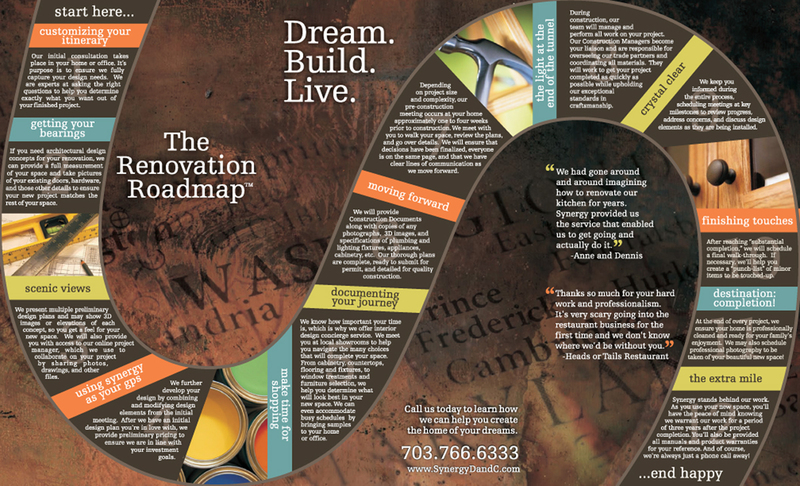 The Renovation Roadmap helps Synergy Design & Construction guide clients through the remodeling process. design/build process the company established to work with clients. It shows clients how their projects will be completed on time, without cost overruns, a ton of change orders or back-ordered materials. Initially, the Renovation RoadmapTM was just a bulleted list that Fies showed to clients. She decided to turn to turn that document into a brochure, which resembles a board game, after consulting with a marketing person, and the Renovation RoadmapTM was born. The name stems from the process of mapping out their process to clients. Fies decided to set up the roadmap as a board game because it reflects the personality of the company’s founders and their approach to client relationships. It begins with “Customizing Your Itinerary,” or the initial consultation with a potential client, and ends with “The Extra Mile,” which delves into how the team at Synergy D&C maintains client relationships after a job is complete (see “Digging into the Renovation Roadmap”). Each item on the Renovation RoadmapTM was created after trial and error over the years. From the beginning, when Fies and her husband started Synergy D&C in 2008, they knew they would only get one chance to make a first impression, so they took time to create a company image through branding, their Website and, later, the Renovation RoadmapTM, to clearly define the goals of their company and the company’s culture to ensure they were sending a consistent message to potential clients. Fies attributes the Renovation RoadmapTM as a big reason for her company’s success. As a marketing tool with for potential clients, the team at Synergy D&C reviews the brochure during the initial consultation to help explain the services they are providing. If a person downloads the Renovation RoadmapTM from the company’s Website, their name and contact information is added to the company’s database for e-mail marketing purposes. The Roadmap has been such a success for Fies’ company that she’s taking the concept one step further and developing an actual Renovation RoadmapTM working binder system so people anywhere can use the system when they are looking to remodel or put an addition on their homes. This working binder, which will work as a manual people can use during the design/build process, will be available for purchase online in Spring 2014. The three-ring binder system will include tabs that break down the process, include questions to ask potential contractors, and the steps toward a successful project completion. The following is a breakdown of the 12 steps in Synergy Design and Construction’s Renovation RoadmapTM. Customizing Your Itinerary: This is the initial consultation with a potential client to gain a clear understanding of what they are looking to accomplish. Getting Your Bearings: At this stage, the company fully measures the space to be renovated and takes pictures as well so the new space matches the existing. This information gets input into their CAD system before they begin designing. Scenic Views: Clients are shown two or three designs of their space, using two-dimensional floor plans and 3-D imaging, which allows clients to literally see what the space will look like. Clients are also given access to Synergy D&C’s online project manager to further collaborate on the project. Using Synergy As Your GPS: Synergy D&C compiles information gathered from the “Scenic Views” meeting to create a master plan for the client. They also compile some preliminary estimates that are in line with a client’s budget. Make Time For Shopping: Clients visit showrooms with a designer from the company to help them select the finishes for their project, including items such as tiles, cabinetry, flooring, furniture and window treatments. Documenting Your Journey: The company provides clients documentation, photographs, 3-D images and build-out specifications related to their remodeling project. During this stage, Fies and her team are also finalizing documentation that’s necessary to complete the construction project, including permits. Moving Forward: Two to three weeks before construction begins, Fies holds a pre-construction meeting with clients to review the project, answer any last-minute questions and note any changes the clients want to make. The Light At The End Of The Tunnel: This is the construction phase. An on-site construction manager oversees trade partners and materials for the project. Crystal Clear: To keep clients up to date on their renovation project, Fies holds a weekly meeting with clients. The company also uses an online project management system that clients can access to see the progress of their construction project. Finishing Touches: When the project is 98 percent complete, Fies and her team walk through the project and create a punch list of items that need completing. They then ask the clients to perform a final walk-through as well and note any items they believe needs to be touched up or adjusted. Destination Complete: Synergy D&C has the home professionally cleaned post project. They also bring in a professional photographer to take pictures of the completed project.